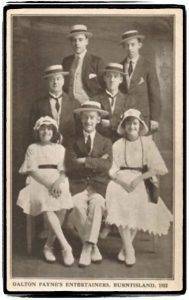 Pierrot Entertainers, Burntisland, – The Fife Post………..for genealogy and historical information. 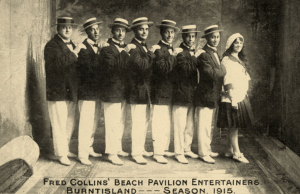 Pierrots or seaside entertainers performed at the beach pavilion in Burntisland each summer from about 1910 to the mid 1930s. (The beach pavilion was demolished to make way for the old swimming pool near the Beacon). The cards show what the smart men and women Entertainers were wearing. Dalton Payne's was one of the many troupes that spent a summer season at Burntisland, before and during the First World War. More active forms of recreation included bowling and tennis, played at, for instance, the Recreation Grounds, which were run by a private company. 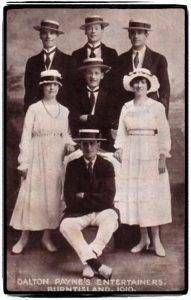 David Dalton Payne (above middle), a Pierrot, was initiated into the Lodge Dunearn 400, Burntisland on 31st May 1920. 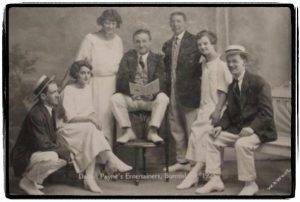 He was described as a Music Hall Artiste.The photograph above taken in 1925 shows Dalton Payne in the middle with his entertainers (Pierrots). 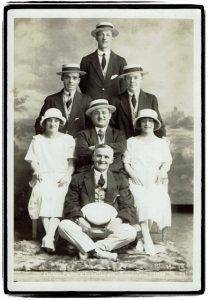 One of the best known entertainers was Fred Collins, his pierrot troupe played at Burntisland in successive seasons. 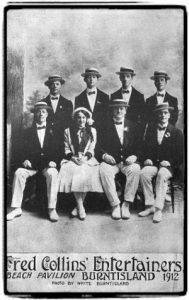 his players including Hugh Rodger, Sam Thomson and Ella Gold. Thomson was known as a great comedian.